This week I take a look at digital thermometer options to use with your beer brewing system. Digital thermometers currently on the market have a wide temperature range, are inexpensive, very accurate and easy to use. In this article I want to focus on digital thermometer options, but first I’ll describe the most popular analog options which include the floating glass thermometer and the kettle thermometer. Most brewers are familiar with the ubiquitous floating glass thermometer which comes with the vast majority of homebrew starter kits. These glass thermometers typically have a temperature range of 0-100 C (32-212 F) and can simply be dropped in the pot or mash tun and left to float. They are fairly reliable though some have questionable accuracy in some cases (usually within a few degrees) and also they are quite fragile. I’ve broken a bunch of these. The next most common thermometer in brewing is the common kettle thermometer (brumometer, brew thermometer) which typically has a dial face that is adjustable so you can calibrate it. These are inserted in a hole drilled in the kettle, and if calibrated properly before use are typically accurate within perhaps two degrees. These are analog thermometers that are often sold with higher end brew kettles or systems, and are great for brewing. More recent innovations include digital thermometers both of the cooking (metal tip) kind and the infrared kind. Finally, Blichmann has introduced a bluetooth kettle thermometer called the BrewVision thermometer that is also digital but communicates directly with your phone. I’m going to cover these three models in this article as each has its advantages over the two more common types. 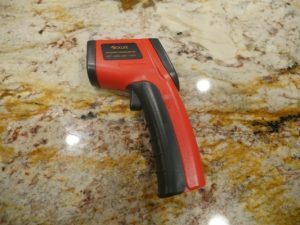 First up is the infrared digital thermometer. I bought this model from TackLife (Amazon affiliate link) as it was inexpensive and had roughly a one percent +/-1F (0.5 C) accuracy. An infrared thermometer shines a low power laser at an object and measures the temperature based on the infrared reflection. So basically to use it you just point and shoot it at the surface of the water and it will give you the surface temperature reading. I found it to be quick and accurate for measuring water, the temperature of the pot itself, and external temperatures of fermenters. Unfortunately the laser fell short when working with an all grain mash tun. I believe the foaming and grain on top of the mash tun interfered with the laser and I found it often gave inaccurate results when compared to my kettle thermometer or other digital thermometers. So I could use this device while heating my water, but not when measuring the mash temperature after adding grains. So unfortunately this is not a great option for all grain brewers who require accurate mash step temperatures. Next up, I tried a simple digital cooking thermometer. This is the inexpensive model I purchased – an RTS digital waterproof thermometer (Amazon affiliate link). Again the unit claimed a +/- 1 F (0.5 C) accuracy level. To use this thermometer you simply dip it in the water, mash or beer, and it very rapidly will give you a temperature reading. At high temperature, I found it worked very quickly – usually settling on a temperature within a second or two. At room temperature it took a bit longer to reach a final temperature, but still gave accurate readings within a few seconds. This unit also did not have any trouble reading mash temperatures or the temperature of any liquid – just dip it in the liquid and you get an accurate temperature reading. I also like the fact that it is waterproof and came with a nice cover and wrist strap so you can keep it handy while brewing. The final digital thermometer I got to play with was the Blichmann Brewvision thermometer. While I don’t own one of these yet, I have been able to see them in action both at Homebrewcon and also another BYO event, as well as play with it as a standalone device. The Brewvision is a kettle thermometer intended to be mounted through a hole in your brew kettles as a direct replacement for the popular dial thermometers used on most kettles and mash tuns. The accuracy of the device is +/- 0.5F (0.25 C). 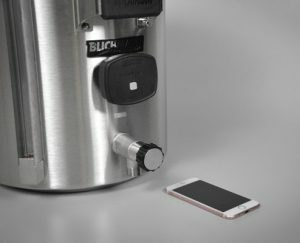 The Brewvision does have a unique feature set in that its bluetooth transceiver connects directly to your iPhone or iPad which lets you monitor and record temperatures (within about 30 feet/10 m if no obstructions). While certainly more expensive (around $99) than a handheld thermometer, I like the flexibility it offers, particularly for monitoring and recording mash temperatures. As every all grain brewer knows, there are considerable waiting periods when mashing – either waiting to achieve your strike temperature or waiting for the mash to complete. Being able to monitor the kettle from across the room on my phone frees me up for other tasks like cleaning, sanitizing or relaxing. Since the Brewvision software also lets you import your BeerSmith recipes directly from the BeerSmith cloud, you can easily record and track progress of the mash or boil remotely. Overall a pretty neat solution to ease what could be a long all grain brew day. So what do I recommend? Having broken more than my fair share of glass thermometers, I’ve basically given up on them. My current brewing setup has a set of conventional (analog) kettle thermometers on it which are accurate enough for basic brewing work, and I also have an electric controller (Tower of Power) that monitors temperature on my system when recirculating. 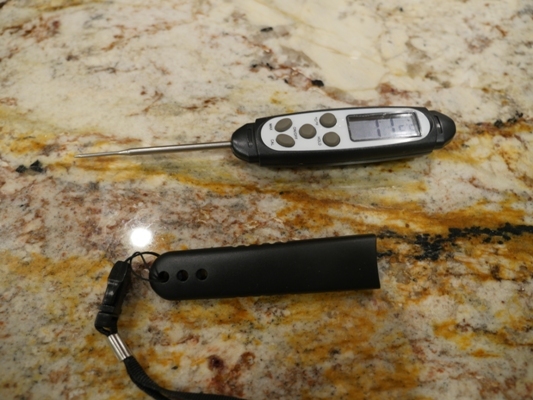 I supplement my analog thermometers with a digital cooking thermometer (Amazon link). The reason I do this is that the analog scale is only accurate to a degree or two F, and also you need a reference point to calibrate the kettle thermometers against. The digital thermometer provides that steady reference point so I can make sure the thermometers on the kettle are giving me the right answer. This style of thermometer would also be suitable for those brewing without kettle thermometers, as it is fast and accurate to use. I am seriously considering a BrewVision thermometer for my mash kettle. That would let me monitor the temperatures on my iPhone from nearby work areas and give me more flexibility during brew day instead of worrying about watching the kettle thermometer while I brew. If you have thoughts on brewing thermometers leave a comment below! Thanks for joining me on the BeerSmith Home Brewing Blog. Be sure to sign up for my newsletter or my podcast (also on itunes…and youtube…and streaming radio station) for more great tips on homebrewing. Also check out the How to Brew Video series I shot with John Palmer if you want to learn more about all grain brewing. Thank you for the article on thermometers for brewing. It was very timely for me because I have been looking for another one since my dial thermometer has a cracked face and I don’t trust its accuracy. What I “wish” I could find would be a digital thermometer with a long 9″-12″ stem and a way to hook it onto the side of the mash tun or the boiling kettle. There are lots of digital thermometers out there that are quite accurate, but I haven’t found any with a stem longer than 5 inches or so. Regarding accuracy, it has always been my understanding that the strike temperature and maintaining the mash temperature are critical parts of the brewing process, and that a difference of just 1 or 2 degrees (F) can affect the outcome of the beer. Then I see that most of the analog thermometers, the kind you can hang on the side of the mash tun, and also the kind that you can screw on to the pot, are only accurate to about 2 degrees, some worse than that. I work with infrared camera’s and Infrared ray-techs similar to what you reviewed here. To get accurate readings on different surfaces you need to know their emissivity (The % amount of temperature the material emits), The other factors are Reflection and Refraction. There are very few materials that get above 99% emissivity and are generally only used for calibrating cameras. Liquids are generally pretty poor to take accurate temperature readings on because you will get a lot of Reflection from surrounding objects as all objects emit heat, and also refraction through the liquid. So, although you may have got a decently accurate reading from the water you would need to change emissivity once there are bubbles, and different solids to measure off of. You may be able to get a bit more accuracy if you set the emissivity higher (0.90 or so) and only open the lid a bit, just enough to get the gun in and take a reading so that any reflection would be coming off of surfaces that are also reflecting the water/wort. Or just use a common style thermometer as they will be more reliable in this application. I’m getting started in brewing, and I plan to start out using a digital probe for my Thermoworks Smoke. They make a long length (12in) high temp probe just for this sort of use. Grab a pot clip to go with, and I can leave it on my kettle while brewing, and have the remote unit around my neck or in my pocket to alarm if I’m getting too hot or dropping in temp, or just use the base unit. This same probe works on a couple of their other thermometers as well, I just happen to have the Smoke already for my BBQ needs.